A very fashionable and elegant derby cane. The pattern is of little blue and pink flowers with green leaves on a rose pink background. 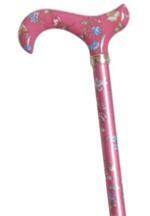 The cane is patterned both on the supportive derby handle and on the aluminium shaft.